Aboard one of the Safariboats you can cruise over 50kms of the river and stay overnight in some of the most scenic areas on the Chobe, parking at prime docking sites along the river. Each houseboat offers guests a personalised experience. The Chobe Princess Safariboats do not have any set departure dates and no minimum number of nights so we are able to fit in with your itinerary and to ensure that your stay with us is as relaxed as possible. Each houseboat has a minimum of three attendant tender boats. 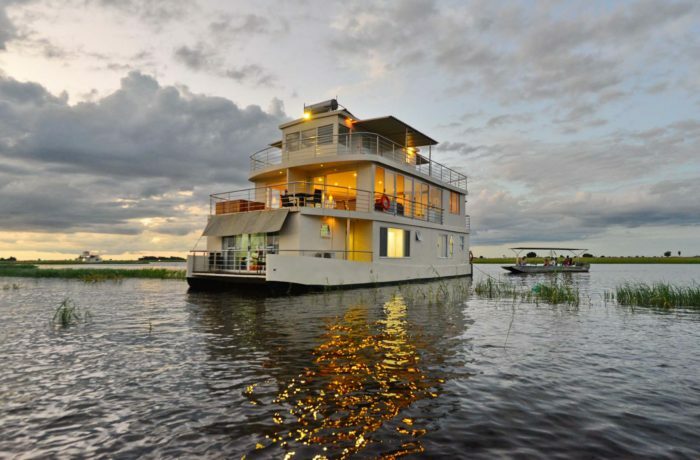 Chobe Princess houseboats provide a memorable way to explore this lush river landscape. Whilst sailing on the Chobe River the houseboat's top deck provides an ideal platform from which to view the abundant wildlife of the Chobe National Park. Other activities offered include fishing on the Zambezi River renowned for its sizeable tiger fish and bream, sunset cruises and birding trips in the tender boats, and visits to some of the local fishing communities in the area. Two or three nights on one of the Chobe Princess houseboats offers an intimate and relaxing way to view wildlife, enjoy spectacular birding, try out a bit of fishing, and take a different mode of transport to the more typical game drive safaris. It makes a great addition to a Victoria Falls visit, or a wonderful beginning or end to a Botswana, Zimbabwe or Zambia safari. Staying on board the Chobe Princess Safariboats is like being on a permanent game viewing vehicle as the docking sites are all situated overlooking some of the prime game viewing areas. Huge herds of elephant can be seen all year round, often swimming across the river in front of the houseboats, to get to the lush Caprivi grasslands. Buffalo, lion, lechwe, puku, giraffe, zebra, sable, kudu and leopard are all frequently seen in this area promising guests an unforgettable wildlife experience. Each Safariboat has four large double/twin cabins, beautifully decorated with the focal feature being the large sliding window that gives you your own personal view of the changing landscapes before you. The cabins also have an en-suite bathroom, each tastefully fitted with a modern shower, toilet and hand basin. Climbing the staircase that connects the accommodation deck to the entertainment deck you will have access to a spacious lounge and bar area that encourages you to take time-out and simply enjoy the view. This deck also has a relaxed open-air dining area where guests can enjoy superb meals prepared by a skilful chef in the full-size on board kitchen. At the front of the entertainment deck, guests can cool off in the plunge pool or simply soak up the African sun on deck chairs while enjoying an ice-cold beverage and the outstanding scenery. The rear of the entertainment deck allows easy access to the smaller tender boats that accompany the Chobe Princess Safariboats on all of their travels. These boats ensure that each guest has the freedom to partake in any excursions or activities that are best suited to their own personal needs.